And just like that…the holidays are upon us! And that means parties, decorations and glamming up your dining room table. But why wait till the end of November? 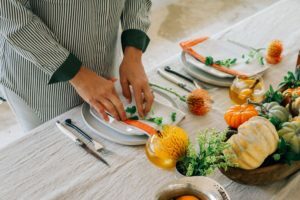 Tablescaping is all about setting the right mood, and while the holidays are particularly fun, you can dress up your table any time of the year. 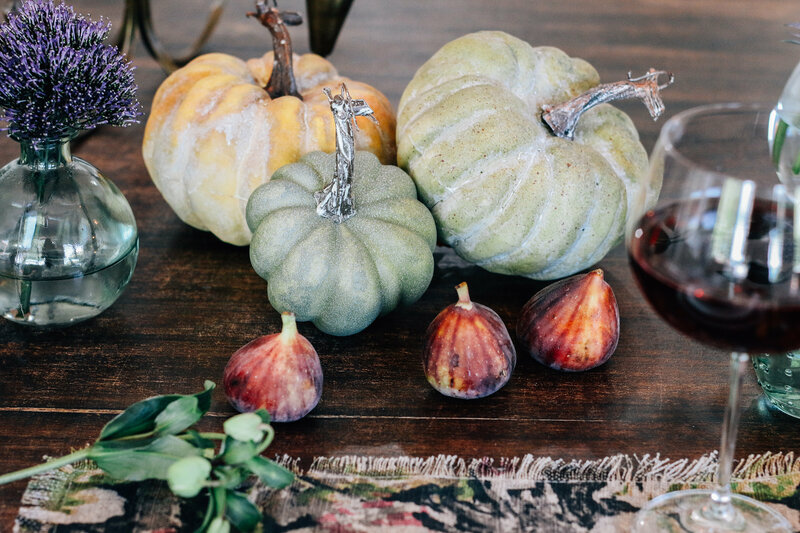 Here are my fall tablescaping tips that will have you entertaining every day of the week. 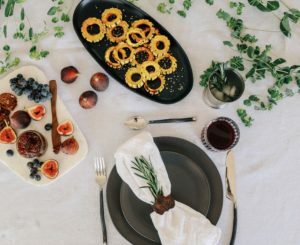 Decide on the environment you want to create, whether it’s holiday entertaining, another special occasion or simply dinner with family or friends. At The Mad Table, we truly love beautiful table designs, as the table always serves to be the focal point at any party that involves a meal. 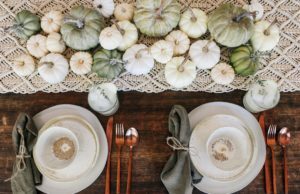 A thoughtfully decorated table establishes the mood, it’s a conversation starter, and it creates the overall ambience for the room where you’re dining. Warm and cozy – example: accessorized table using deep rich colors. Placemats with purple and/or grey, beautiful brownish-red figs, chocolate brown candles in brass candle holders, gold flatware for a warm glow and then balance the look with very light pink plates and light grey napkins wrapped with grey velvet ribbon. Decorate with natural elements, like cinnamon sticks on napkins, succulents on plates, greenery and a few purple flowers for the table. Pumpkin explosion – light and airy. Kept it super simple but bold with lots of colorful pumpkins on a macramé runner. Traditional – warm shades of orange and green everywhere! This is my most traditional look – with a little edge. 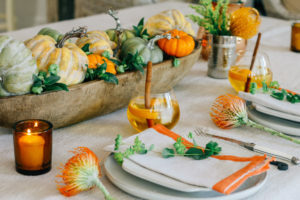 Burlap tablecloth, wood canoe as centerpiece with geeen, orange and yellowish pumpkins, earthy plates and amber glass votives. Mix things up with different metals for flatware, silver tin cups as vases and a copper pitcher for orange and rosemary infused water. My minimalistic table – white French linen, intentionally-wrinkled tablecloth and only a few, simple decorative pieces (no vases and greenery directly on the table). For a daytime, casual affair, anything works (except paper and plastic), so get creative and express yourself with your table designs. Set flatware on top of napkins, to the left or right, or even on top of your plate. Mix and match china or glassware. Mix metals in flatware and glasses. If using rectangular fabric placemats, try positioning them vertically so they hang down from the edge of the table instead of horizontally below the plate. For a traditional look, be more consistent with your china and table setting – forks to the left, spoon and knife to the right and dessert fork or spoon above the dinner plate. And always place forks in order of use: salad fork on the outside and dinner fork on the inside. Linen napkins are critical, but you can experiment with their appearance and placement. Fold napkins in half and wrap them around your plate horizontally or vertically. Place them on top of or below the plate, to the left or to the right. Don’t feel like ironing? Just open them all the way and tie in a knot. Tablecloths and runners always add an extra decorative touch to the table. Flowers are a must, yet don’t have to be terribly expensive. Herbs or clippings are beautiful and thoughtful touches. We especially love using a mix of vases paired with various greenery and flowers. Groupings of threes are always pretty. Non-scented candles create the perfect ambience for evening dinners. We love chocolate brown candles for fall. Add an extra element to your plate setting. A small bunch of fresh thyme wrapped with twine or jute, an individual flower stem, mini pumpkins, persimmons, pomegranates, figs, a small glass bud vase filled with wine, etc. Use your imagination and check out the fruits and veggies in season at your local farmers’ market or organic grocer. The ideas are endless! Try infused butters for rolls and breads and serve salt and pepper in pinch bowls instead of shakers. Name cards and menu cards are always fun and can be handcrafted. Even a pretty, custom card saying “thankful” adds a personal touch. Your table is an entertainment hub, a place to create memories, and (let’s be honest) the gorgeous backdrop to the delicious meal you’ve prepared. 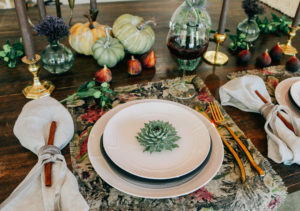 Enjoy tablescaping, and set the perfect mood for a fabulous dinner. For more tips and tricks on creating the perfect home environment for your family (during and after the holidays), visit us at The Mad Table website. And be sure to like The Mad Table on Facebook and follow us on Instagram for all the latest news, fabulous recipes and gorgeous entertaining tips and ideas.